London, November 2016 – Britax Römer has unveiled its new five-point-harness child car seat that transforms into a highback booster seat as the child grows. The new seat, EVOLVA 1-2-3 SL SICT, provides superior safety for children aged 9 months through to 12 years (9kg-36kg) and is available in five colours. As babies get older and outgrow their infant carriers, parents have got two options – they can either move their child into a group specific car seat (such as a Group 1 seat that will take them through until about the age of four) or they can opt for a combination seat that covers a wider age range. While car seats specific for each age group are tailored to the development of the child, parents can now purchase high-performance Group 1-2-3 child car seats without compromising on safety. The new EVOLVA 1-2-3 SL SICT is Britax Römer’s next generation child seat that makes the current EVOLVA 1-2-3 seat, popular among parents for over 10 years, even better. It can be installed with a three-point belt and ISOFIX that connects the seat directly to the car for superior safety performance. It also includes the Britax Römer SICT for side impact protection that minimises the force of an impact on your child in case of a side collision. The SICT deforms and simultaneously absorbs energy from the crash before it reaches the child. Transferring the child car seat to another car is easy with this lightweight product, that can be safely installed in most cars, either with a three-point seat belt and ISOFIX or with the three-point seat belt alone. It is available in selected retailers from £210 starting from November 2016. Highback boosters are the safer alternative to booster cushions popular on the market. 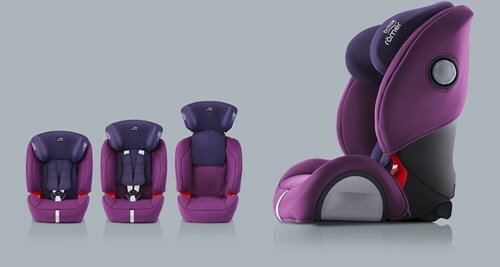 They protect your child in three ways: the seat shell provides head to hip protection for your child, especially in the case of a side impact accident; the upper and lower belt guides provide correct positioning of the seat belt; and the padded headrest provides safety and comfort for your child’s head and neck. The new cover designs are stylish, while soft fabrics on the headrest and performance chest pads guarantee an extra cosy feeling for the child and are made of durable fabric. The machine washable seat cover can easily be taken off without removing the harness.